Hot tubs have so many great attributes therapeutically and physically. If you are in the decision making process of buying a hot tub there are many great factors in having a deck to surround your hot tub. Not only are decks great for keeping the area around your hot tub easy to enter and beautiful in appearance they have practical value as well. There are many ways to consider how you want to install your deck and hot tub as well as materials to choose from for sturdy and beautiful decking around your gorgeous hot tub. The beauty of having a deck installed with your gorgeous hot tub is a definite plus if you are considering the addition of a deck to your hot tub. Make sure you choose the right model for your type of decking. There are different ways to install decking with your new hot tub. If you choose to sink your hot tub into your decking, be sure your decking is secured in strength. 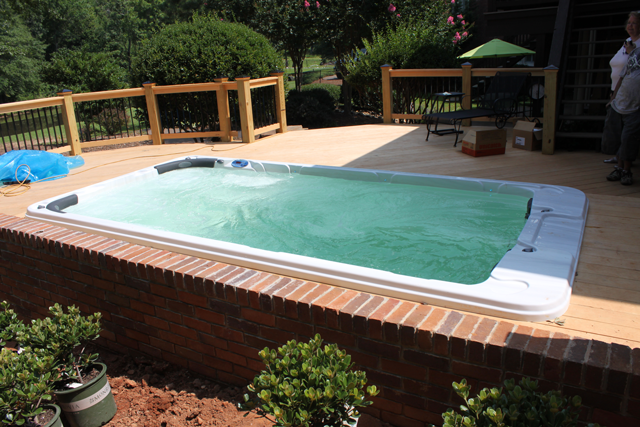 Hot tubs and water are very heavy and over time your deck can become weak from the pressure of both being unsecured. Choose your hot tub decking as carefully as you choose your beautiful hot tub. The space you choose for your hot tub will need to be accommodated for your decking. Be diligent measuring just how much space you will need for both your deck and gorgeous hot tub. Space and placement are important to comfort and beauty when installing your new hot tub with a spectacular deck. You will want to make sure when you are choosing your deck materials that you choose according to whether it is inside or outside. You have a bevy of choices for both that are beautiful and sturdy and this is your gorgeous hot tub so choose both practicality and beauty for the long run. Some models to choose from that have absolutely gorgeous quality. These models also have the ability to fit right into a deck designed around their installation. Remember to allow for access for repairs to your hot tub when you have your decking installed because you do not want to have to remodel your deck if adjustments need to be performed on your hot tub. Considering whether your hot tub is inside or outside is also important when choosing decking to go with your hot tub. You want materials that are weather resistant if it is outside and for inside you want a reinforced decking that is complimentary to your décor inside. Having your hot tub installed inside is much the same as having a bath tub installed for your home. You want to consider all the hot tub options for beauty and protection in your home as you consider your gorgeous hot tub and deck.